Immediately after the wedding is over, it’s time select a best destination for your honeymoon. If you’re looking for a beautiful place to enjoy your honeymoon, Maldives may be an amazing place for you. 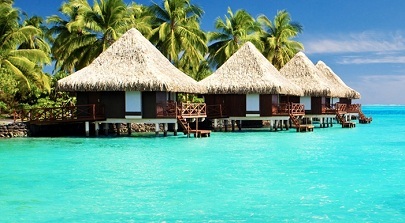 Among various hot destinations, Maldives is one of the most popular destination among honeymoon couples. Today we have sored out 5 best perfect destinations in Maldives for a fun filled honeymoon vacation. This is one of the best resort in Maldives for honeymoon couples. The resort is a 15 – 20 minutes boat ride from the Airport. Here you can do plenty of water activities with snorkelling and diving. Kurumba is the first private resort that opened to tourists in the Maldives in the 1970’s. It has 180 rooms (including villas) with 8 different styles to choose from. For anyone planning a honeymoon trip, we strongly suggest Kurumba to them. If you like to be on the go and plenty of nightlife, this place is not for you. 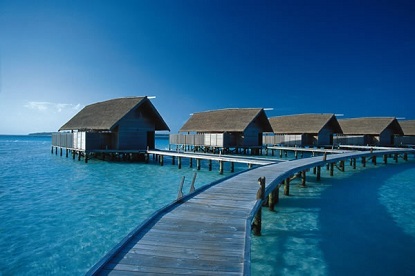 Another popular island and destination in Maldives for Honeymoon or a vacation. No words can describe the beauty of the place. Sun island resort is on a small island about with about 2 Kms of beaches all around. You will love the blue sea, beach with white sands and clear water. Sun Island Resort and Spa is very calm and relaxing. No people, no malls, only one local small shop, few restaurant, no nightlife. This place is very perfect for honeymoon couples. Lots of activities you can do here like water sports, scuba diving, snorkeling, boat rides etc. Alimatha Island, which is very popular among honeymoon couples, located at the Vaavu Atoll on the eastern side of the Maldives. You can reach Alimatha Island from airport through a speedboat or a seaplane. Just select this place for your honeymoon in Maldives, you will delighted by the magnificent ambience of the island. It is a complete Maldivian destination for honeymooners. Alimatha Island offers aquarium-like snorkeling, world-class diving, with great facilities. 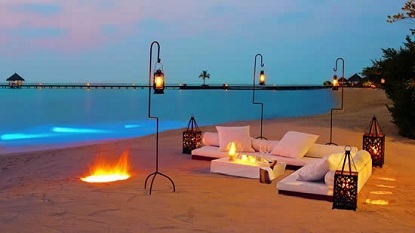 Absolute heaven and perfect place for honeymoon couples. Kanuhura island is very beautiful island. You will love the surrounding lagoons, reefs and uninhabited islands. So if you are a couple on a romantic journey, Kanuhura may be an amazing place for you. Another beautiful and amazing destination for honeymoon couples. There are plenty of stunning properties throughout Maldives, but Cocoa is very special among them. You can do activities like Sunset Fishing, Snorkling, scuba diving etc on Cocoa island.